Imagine you are in a crowded, busy place such as a concert, a demonstration, a protest, in a square, park or at a festival and you want your friends to see where you are. Imagine you are looking for an Uber, Lyft or Taxi in a crowded place but how will the driver find you? How will You find your friend in the crowd? 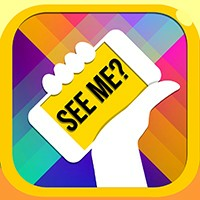 I’ve developed an app called See Me? It lets you find your friends or lets them find you, wherever you are, easily and fast by making a flashing billboard on your phone.